Every Twin Cities area home is complex and contains a wide variety of construction materials, features, and systems. From time to time, repair work is necessary. When those repair needs come up, only experienced professional workers can do the job properly and safely in most cases. While some home repair tasks are simple enough for homeowners to handle, most require building trade specialists with the experience and training needed to do the job efficiently and correctly. Top quality home repairs require top quality workers. At our Minnesota handyman service company, each member of our carefully selected team of general handymen, plumbers, painters, electricians and carpenters has the training and long experience needed to perform a wide range of repairs in your home. When you call us to request services, we’ll identify the type of repair you need, and assign a seasoned craftsman to the job who is fully qualified to handle that repair correctly, professionally, and safely. We match each home repair job with the right workers, unlike some handyman services, which rely on general handymen for every job. The difference is important, since poor quality work by unqualified workers is never acceptable. Plumbing Repairs – Do you have leaky pipes or valves, drippy faucets, a running toilet, clogged drains, dishwasher problems, or a hot water heater on the fritz? Call our plumbers for fast, professional repairs for any plumbing problem. Electrical Repairs – From broken outlets and light fixtures, short circuits, and circuit breaker problems to defective ceiling fans, flickering lights, intermittent electrical faults, smoke detectors, and more, our electricians have the solution. Drywall Repairs – Our handymen can quickly repair or replace damaged drywall in your home, and repaint the repaired area. Heating & Air Conditioning Repairs – We’re on call to diagnose and repair most common problems with these systems, including air duct leaks and thermostat replacement. Carpentry Repairs – From replacing damaged woodwork and repairing cabinets and storage shelves to repairs on your homes framing, our seasoned carpenters have the skills you need. Door & Window Repairs – Our Twin Cities handyman service will quickly fix sticky, dragging doors, replaces locks and hinges, and repair broken windows and screens. Appliance Repairs – We have skilled major appliance repair technicians on call whenever you have problems with washers, dryers, dishwashers, or any major appliance in your home. Floor to Ceiling Repairs Throughout Your Home – Call our expert handyman service for expert repairs on your home from top to bottom. 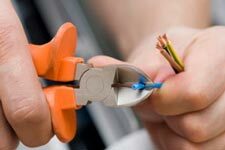 If any part of your home needs to be repaired, we’ll get the job done quickly and correctly. At our Minneapolis St. Paul metro area handyman service, we’re always standing by to make repairs on any part of your home’s interior or exterior. One call to us will bring an experienced, courteous, fully qualified craftsman to your home. We’ll give you a free, no-obligation estimate of the cost of your repair after assessing the problem. With your approval, we’ll make the repairs quickly and properly. Your complete satisfaction is our standard of service. Take a look around your home and make a list of all the repairs needed, and then give us a call. You’ll be surprised at how much we can do in one, very affordable visit. Call today for any repair need in your home.